We have been neglecting him. He has opened a tailor shop and is there regularly. This is quite subdued and agreeable for the King. An experimental sleeveless Nehru jacket. Fully canvassed. Experimental ensemble indeed. The white day cravat (yes!) and pocket square are really way too posh for this relatively rustic patterned woolens. I'm also very iffy on the plaid and check combo. This is actually really good if you ignore his odd ideas on the placement of buttons on double breasted coats and his habit of jamming crap in his shirt pocket. The relatively restrained bichromatism is a good strategy for him. Anybody know any more about his tailoring establishment? I note that in his blog he gives a figure of 36,000 Taka for top-of-the-line, full-canvassed bespoke. Since this translates to a touch over $462 (U.S.), it sounds like a helluva deal if the suits are halfway decent. Perhaps they should do U.S. tours. 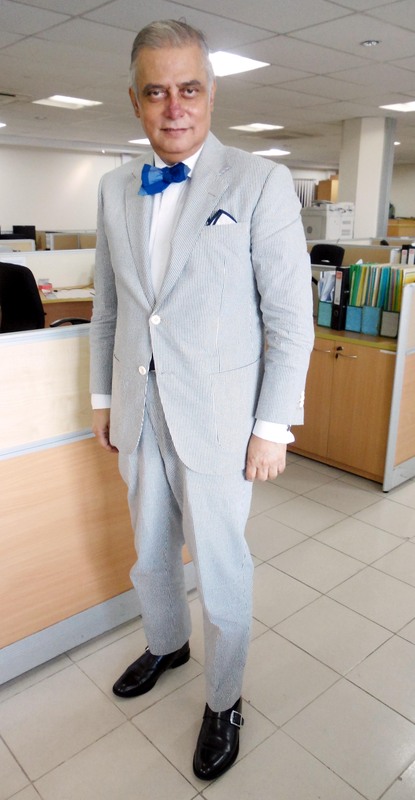 However, I am aware that a lot of Indian tailoring, especially in the diaspora, is rather suspect. That coat pattern is ... something, and probably not advisable with checked pants. Linear patterns really highlight stretched fabric! Anyway, the flapped chest pocket is something I haven't seen outside of crazy pleated one on shooting jackets. How goes it with the King? Been neglecting him. You asked for it. Bam! I'm really liking his summer suits. They all fit pretty well. His shirt/tie combos are atrocious, as usual. For real, he gets the Southern Trad thing down better than most native Andylanders. The cutaway collar with a madras tie is pretty wrong in my book, and that one plaid shirt is a mistake, but overall he's pulling this off very well. Tie and shirt too matchy matchy. I think he is Sprezzing with the buckles on his right shoe. There is a great Indian restaurant in the basement of one of the Patrice Lumumba Peoples' Friendship University of Russia student dormitories. I approve. THAT GAYBERRY IS A FRUITCAKE! DOESNT STAND UP AND FIGHT LIKE A REAL MAN. What's up with the dangling collar pin? 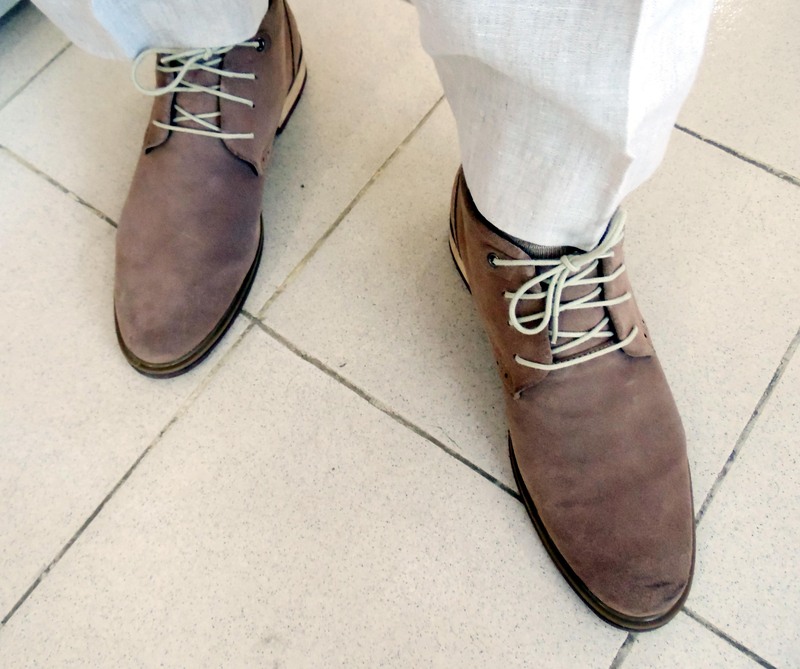 It boggles my mind that people that want to pair light shoes with dark suits manage to bair plack shoes with light summer fabrics like seersucker. The fit is no longer worse than RTW. That blue bow tie is a wreck. Bow tie looks like a fishy. Who is this person? I never have asked before. Does he post on SF or AAAC? He's some IT CEO in Bangladesh. Supposedly a member on SF (if any members can look it up...) although not superactive. He's the VoxSartoria of the nation, or something. Whatever criticisms people may have, the King has style. It's undeniable. Yes, I completely missed the piping on the breast pocket. There is diagonal piping balance and symmetry. Baller. 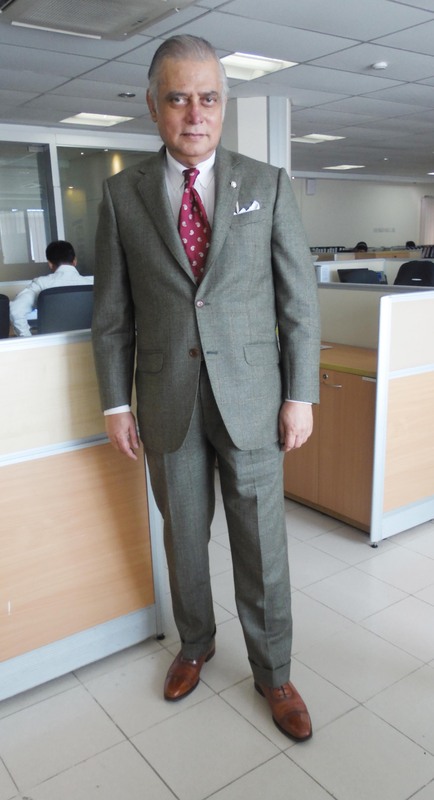 I don't know who this King of Dhaka is, but he is fascinating, AND he has a lot of shoes and a heap of suits.